Martin Kaye Solicitors – Telford - Shropshire – Newsletter: It's a wrap! Staff from our Personal Injury Team have Christmas all wrapped up when it comes to raising cash for charity. They volunteered to help on the Christmas gift wrapping stand in Telford Shopping Centre, wrapping presents for members of the public for a minimum donation of £1, to raise money for the Midlands Air Ambulance. 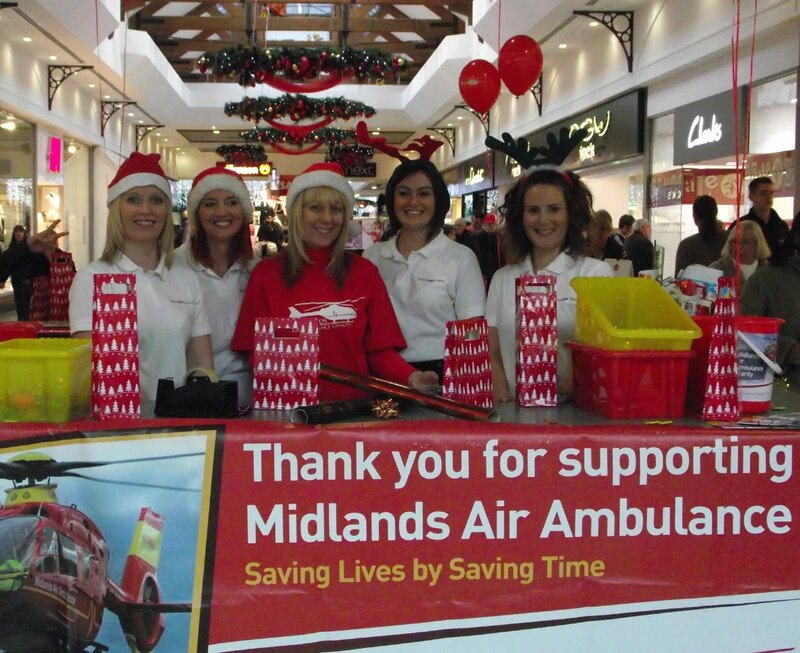 Sophie Davies, for the team, said: "Midlands Air Ambulance staff, fundraisers and various local volunteers manned the stand for a week to raise vital charity cash. And we decided to volunteer our time for a day to help them boost their total - it turned out to be a very busy session for Santa's newest little helpers!" The gift wrapping stand is opposite Debenhams in the town centre, and is supporting several different charities in the run-up to Christmas. The Midlands Air Ambulance is the only charity responsible for funding and operating three air ambulances serving Shropshire, Staffordshire, Herefordshire, Gloucestershire, Worcestershire and the West Midlands. Since 1991, the charity has responded to more than 34,000 missions averaging 3,000 per year or nearly ten each day, making it one of the longest-established and busiest air ambulance organisations in the UK.